If you are going WRND then the first black box you looked at will be perfect. As mentioned it is a nice piece of kit. You need a take up from the crank battery and please investigate what the guys are saying about the D4. I know the electrical systems are finicky. 16mm multi core or multi core welding cable would be a good choice but you can probably use less mm2 with the DC-DC. WRND will be able to recommend what cable will be best suited, usually 4mm2 or 6mm2. You will need a good in line fuse. NL do a good one you can buy separately from any 4x4 shop and you can get the spare fuses for them. 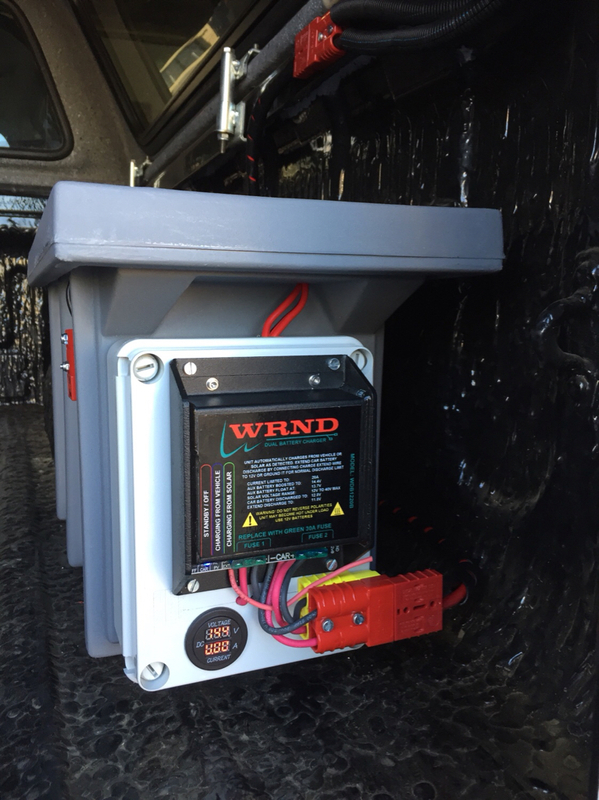 After the WRND you can feed the black box via the red 50 amp input or direct to battery. Now you can decide what battery you want as the WRND will not limit you as the solenoid would and should feed the 14.4 minimum that a deep cycle will require. Oh Yeah. From what I saw of the box, the red input looks like it is a fused feed to the terminals. I would need to have a good look inside or confirm with NL but I think I am right. if this is the case you can do what I did with my Benton charger. I got a spare connector from family dog and cut the clamps off, then wired in a red BH. This allows me to plug in my boxes without any kind of special connectors. Thanks for this. Makes sense and I do prefer the black box and WRND setup as it allows solar at a later stage. What 220v chargers are recommended for when there is 220v? Wow, lots of choice and opinions. Family dog will give you first class advice on the Bentons, then you have the Midas PSA008 and then the NL product. Any of these would be good. Something bugged me through this process. it was mentioned that the D4's need some special attention due to the finicky electrical system. There are umpteen threads around LR battery problems. Taking this into account may I suggest that you look at an isolator on the main feed from the crank to the aux box. This way when the box is not actually in use you can separate the systems. The aux box can be charged with the charger or solar while being separated in preparation for a trip or when 220v is available. just a bit of extra protection. I don't know if the breaker on the box will isolate completely. Yep, apparently there is a 12v wire that is used to 'activate' the D4 alternator to charge fully. As soon as I have all the items I'll confirm the extra process with WRND if necessary. Morning All, any idea what the price is on the new NL box as per the picture attached in this thread? Kindly advise. Just to confirm now, that I have connected it all. I ran a 12v ignition wire from the aux 12v socket (which is on with ignition and off again after ignition swtiches off + 5min or so) to the WRND charger and this will ensure the battery stays charging even if the primary vehicle battery is full. Will take a couple pics when I get a gap and share. Thanks to everyone on the thread for the assistance and advise. So here is what i did with my Navara's second battery. I used the NL solenoid and dual battery monitor. I built the battery into an ammo crate. The 105a/h im using fits nicely into the crate. With space for all the rest later. I then added plugs into the box, both the arb and normal style 12v cigarette lighter plugs. On the back of the crate (against the bak) i added a grey Anderson plug which the cable come from the solenoid in the bonnet. Was an easy run on the Navara. The lights i installed in the canopy are connect via a banana jack. The low amps the LED lights use means the jack is perfect. Now what this means is that if i wanted to i unplug the jack and the Anderson plug and simply remove the crate making the battery portable. Ive used it on a camp weekend once or twice and works like a charm. In the future if you I want to add a solar charger and solar panel, all i will do is install the charger into the same create as there is space for it. I will then just install a red Anderson plug on the crate as not to become confused with what plug goes to which supply. I hope this helps, and gives you an idea of how its done. Nice set-up. How did you connect the WRND to the Brad Harrison plug as the wires are a lot smaller than the crimp part on the pins of the Brad Harrison? My only problem with the battery box is that it is bloody big and ergonomically does not fit the footprint I have for it behind my fridge in the boot. I will be splitting the electrical control box from the battery so that I can fit everything in the way I want it (need it to be). My other problem is that I bought the Nat Luna 5A Charger ........ simply too lightweight in my opinion, recovery time way to long. I was wondering the same thing, until I youtubed the best way to connect a Brad Harrison / Anderson plug. It's called flood-soldering and is pretty cool. I stripped the insulation on the wires back double the normal insertion length of the BH lug, bent strands in "U" shape inserted in lug and crimped with Hex crimper set to smaller diameter than the normal 16mm. Lug ends up a bit distorted but is still fine for insertion in BH plug. The yellow BH plug below the red one is for the solar input.